On July 4, 2012, CERN announced the discovery of a new subatomic particle that's consistent with the Higgs boson—a particle that's been searched for since the 1970s. Whether it's the Higgs or something that closely resembles it, a new particle is a historic discovery. See "Higgs within reach" on CERN's website. Click on the image above for a helpful cartoon explanation of the Higgs Mechanism. Scientists at CERN use the enormous ALEPH detector in their search for the Higgs particle. CERN scientists were unsure whether these events recorded by the ALEPH detector indicated the presence of a Higgs boson. 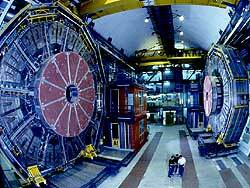 Check out the links listed below for the latest information on the search for the Higgs Boson.